COMPASSIONATE CLIMATE ACTION: "Our Enemies Teach Us What We Must Do"
our enemies teach us what we must do." I have a great example of that quote in action to share with you this week. But first, I'd like to show you something that a famous 20th century orator said -- something that is as relevant to environmental crises and the climate change emergency as it was to the social and economic ills he was addressing in 1960s United States of America. There is nothing wrong with a traffic law which says you have to stop for a red light. But when a fire is raging, the fire tuck goes right through that red light.... Or, when a person is bleeding to death, the ambulance goes through those red lights at top speed.... Disinherited people all over the world are bleeding to death from deep social and economic wounds. They need brigades of ambulance drivers who will have to ignore the red lights of the present system until the emergency is solved.... Massive civil disobedience is a strategy for social change which is at least as forceful as an ambulance with its sirens on full. A massively funny act of civil disobedience took place this week near Washington, DC at the Homeland Security Congress. The Yes Men pulled off one of their stunts again. 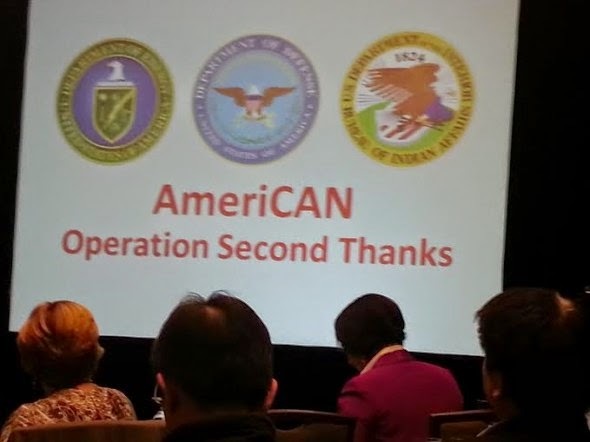 You can read about the Operation Second Thanks "prank" here, read the speech of "Benedict Waterman" from the "Department of Energy" here, and read "Bana Slowhorse's" speech here. I can tell you it was civil disobedience by how many loop-the-loops my stomach did just reading about their antics! I think I'd rather be arrested than have to get up the nerve to do what they did. But these are our ambulance drivers. These are people willing to race through red lights. Taking the truth about the global climate change emergency to people and organizations who would not normally listen, except when sirens are blaring and lights are flashing. Back to Goethe. The attendees -- security and defense contractors, lobbyists and officials who might be considered "the other side" if not exactly the enemy (we'll save that term for fossil fuelers and bankers) -- were extremely receptive to the mythical American Renewable Clean-Energy Network that Yes Man Andy Bichlbaum presented. They have, therefore, taught us "what we must do." They showed us that they're ready to move. They just need to be nudged and encouraged. Monsieur Obama certainly isn't encouraging these people to get into renewable energy. But he could be. So folks, if it's true that AmeriCAN, then let's send as much encouragement as we can -- to Obama, to US entrepreneurs, to the US public. That's "what we must do." Thank you to all the participants in this wonderful project. I wonder if you know this: that you've shown us what we can do.